Remember Hakuna Matata, that ridiculous Disney jingle? Now, remember how long ago it was that you went to a movie theater and saw The Lion King? I was going to stun you with the answer and say it’s been about twelve years, but I just Googled it and now I’m just stunning myself. It’s been seventeen. Oh, and that millennium change? Now that was twelve years ago (obviously), but in some ways, honestly, doesn’t it feel like yesterday? It does for me. I was with my young family, standing on a bridge on the Yarra River in Melbourne, Australia, gripped in the crush of thousands upon thousands of individuals who had converged there to witness the same momentous milestone. As the office tower countdown clock ticked backward, every single one of us took our cue and chimed in, marking, with a crescendoing urgency, the final thirty seconds of the twentieth century. When we converged on zero, a lone firework launched like a rocket from the tower’s rooftop and showered us with white light. Then, for the next twenty or thirty minutes, a riot of color exploded across the summer night sky, and all I remember is a feast of color, and pyrotechnic invention, and optimism that brought oohs and aahs to our voices, and tears to my eyes. Ladies and gentlemen, the preceding corny episode was brought to you by…. So speaking of tears to my eyes, anyone else in Bali find difficulty negotiating a path across their yard amid the firework fog last night? Any suggestions on how to convey the point of fireworks to an island still getting a handle on their charms? It’s to mark midnight on December 31st, not the two weeks leading up to it, people! And now that I have, I’m going to make a frittata. Because I always make a frittata when there’s family and leftovers and I want to spend enough time at the stove to share one of my life’s passions with those I love, but not so much that I can’t hang out with them. So while the little egg concoction takes care of its little old self in the oven… Happy 2012. Means no worries. The basic formula is half and half. Half eggs, half filling, so for you and a friend, try 3 eggs and about a two-thirds of a cup of filling. What’s the filling? That’s up to you. 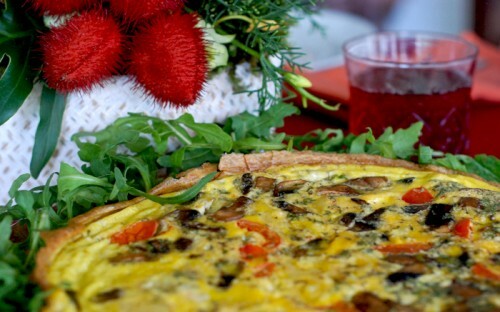 Anything you can put in an omelet, you can put in a frittata. Here’s one idea. Preheat the oven to 350˚F (180˚C). Slowly preheat a heavy-gauge, 6-inch ovenproof skillet until it is evenly heated. (An evenly heated pan is less likely to cause sticking.) Do not let it get so hot that it may burn the butter or brown the eggs. Combine the eggs with the remaining ingredients and stir gently. Melt the butter over low heat and pour in the egg mixture. The mixture should bubble ever so slightly along the edges and heat just long enough to set along the bottom and sides of the pan. Transfer the pan to the oven and bake until the eggs are tender, but set all the way into the middle. Remove the pan from the oven. To transfer the frittata, center a plate over the pan and flip it over so the frittata drops onto the plate. Flip it once more onto another plate so the more attractive side is facing up. 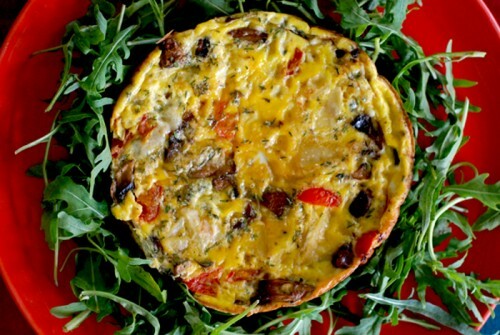 When you are ready to serve, line a serving plate with arugula and slide the frittata onto the center. Hope you have some time to do some serious eating whilst in Melbourne. Happy New Year to you and yours for 2012. ~ Steve, January 1, 2012 at 5:42 pm. HAPPY NEW YEAR KAREN……I wish you and those you love the best of everything. I am just back from a family trip to South Africa and Madagascar. Check out the photos on my facebook page and Elissa Lubarsky’s (my son’s girlfriend) facebook page. The trip was a great lead up to 2012! ~ Jane Dara Rosenbloom, January 2, 2012 at 5:02 am. beautifully written, as always Karen. Entertaining and enlightening in a para — thanks! ~ jenny, January 6, 2012 at 12:00 pm. Another super easy to make recipe, thanks Karen! ~ Shayela Cowen, February 28, 2012 at 10:30 pm. ~ gretchen, May 8, 2012 at 3:14 am.